In asymmetric warfare, early detection and identification of trace level chemical and biological agents and explosive compounds is critical to rapid reaction, response, and survivability. While there are many methods currently being used that can detect these threats, none allow for the unique fingerprinting of threat agents at trace levels. A research team, led by Drs. 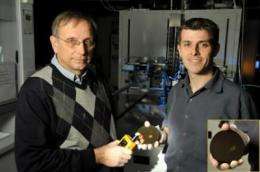 Joshua Caldwell and Orest Glembocki, scientists at the U.S. Naval Research Laboratory, Electronic Science and Technology Division, has overcome this limitation with surface enhanced Raman scattering (SERS) using optically stimulated plasmon oscillations in nanostructured substrates. Shown to provide enhancements of the Raman signal, large-area gold (Au) coated silicon (Si) nanopillar arrays are over 100 million times more sensitive than Raman scattering sensing alone, while maintaining a very uniform response with less than 30 percent variability across the sensor area. "These arrays are over an order-of-magnitude more sensitive than the best reported SERS sensors in the literature and the current state-of-the-art large-area commercial SERS sensors," said Caldwell. "These arrays can be a key component of fully integrated, autonomously operating chemical sensors that detect, identify and report the presence of a threat at trace levels of exposure." Raman devices use laser light to excite molecular vibrations, which in turn causes a shift in the energy of the scattered laser photons, up or down, creating a unique visual pattern. In the case of trace amounts of molecules in gases or liquids, detection through ordinary Raman scattering is virtually impossible. However, the Raman signal can be enhanced via the SERS effect using metal nanoparticles. Despite surface-enhanced Raman scattering being first observed in the late 1970s, efforts to provide reproducible SERS-based chemical sensors has been hindered by the inability to make large-area devices with a uniform SERS response. 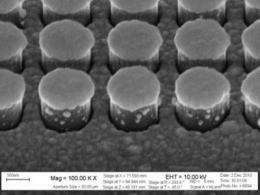 The ability to reproducibly pattern nanometer-sized particles in periodic arrays has finally allowed this requirement to be met. "While many tools are currently available to detect trace amounts of chemical warfare and biological agents and explosive compounds, a device using SERS can be used to identify these minute quantities of the chemicals of interest by providing a 'fingerprint' of the material, which all but eliminates the prevalence of false alarms," says Glembocki. SERS offers several potential advantages over other spectroscopic techniques because of its measurement speed, high sensitivity, portability, and simple maneuverability. SERS can additionally be used to enhance existing Raman technologies, such as the hand held and standoff units that are already in use in field applications.